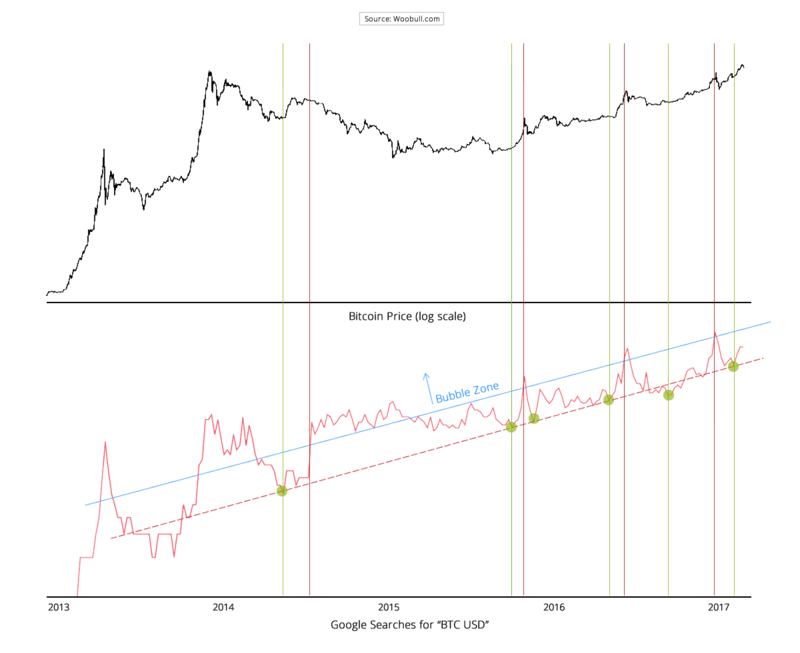 I wrote previously that Google Trends on the search term “BTC USD” is a great way to track the growth of active Bitcoin users. The search “BTC USD” is a proxy for the engagement of active Bitcoin users as they check the daily price. In the chart above, the baseline denotes the exponential growth of active users while height above the line denote their engagement levels. When engagement levels get high, Bitcoiners are in party mode, checking the price daily of of their precious coin. If engagement levels are too high, that’s when we are in a price bubble, and it’s a good time to sell. Here’s that graph again with the “bubble zone” drawn. Conversely, when engagement is at all time lows (marked with green dots), this is a good time to buy. Put together, using our “Google Trends oracle”, we have a pretty reliable buy and sell indicator. With the latest all time highs of these last weeks and months, we’ve heard the bubble word come up a lot. But clearly we can see Bitcoin is not in a bubble. We still have plenty of room for our bull run.